Know what business you’re in. Have a strategy and be committed to pursuing it. Keep new ventures free from the rules of the old. Let the people running a new venture do what’s best for their business, regardless of the potential impact on the old. To compete in a new medium, you have to understand it. There’s still too much of a sense of entitlement in the industry. The Associated Press spends too much time making the case that copyright violation is the problem bringing the industry down when the industry should be focused on building new and better products and services. Are companies making the same mistake in this decade that the Rocky made in the ‘90s, not understanding the competition? I think so. 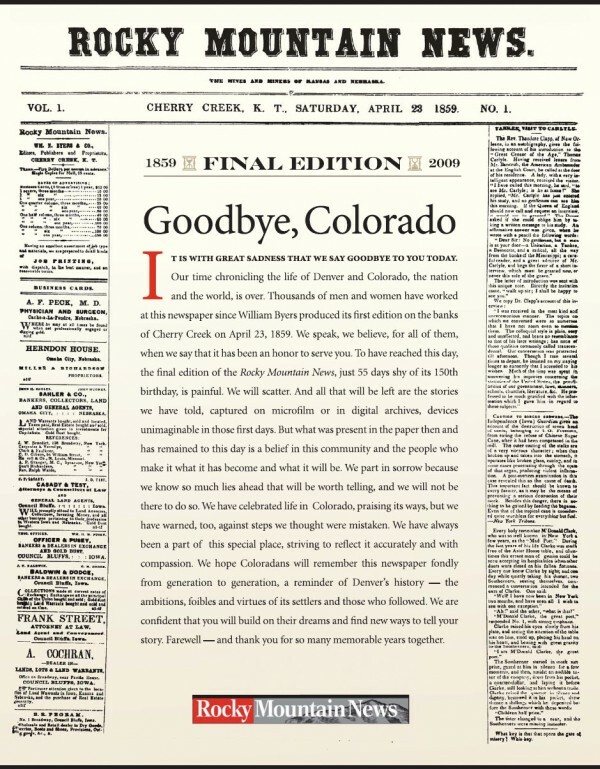 Newspapers have traditionally served a small percentage of the businesses in their communities. … Newspapers should find more ways for more local businesses to reach potential customers. Newspapers should give consumers more control. They’re still thinking too much about themselves and not enough about what the consumer wants. And, of course, finally, the most difficult recommendation of all, newspapers should stop making decisions about new business opportunities based on how they’ll affect their legacy business. The main newspaper cannot dictate the shape of the future.